I recently had the pleasure to fly out to New Brunswick for love story shoot of Simone and Daniel – Which I was commissioned out by PhotoTerra Studios to shoot. As I was invited to the couples Pre-Wedding BBQ at their Ocean Front Cottage, I just couldn’t help but bring the camera and join in on the fun. I put together a short piece to tease the couple of what their wedding video would look like; the response I received was simply Amazing!!! When putting a full feature together, it takes a couple of edits before we’re happy with the end product… with this video, I’m struggling with choosing clips from the large amount of amazing shots we took covering the preparations of Chris and Evangeline. There was so much emotion, so many wonderful stories and an overwhelming amount of magic – Wait till you see the church! Here are a few minutes from their full feature (I don’t want to spoil their first viewing at the studio’s theatre for the reveal) – But I’m sure it’ll be re-worked a few times more… so here’s take 1! As we drove home from this event’s coverage â€“ he couldnâ€™t stop talking about how much fun we had as a result of the coupleâ€™s easy going attitude, their fun and crazy wedding party, and a hall full of happy Europeans! We had the opportunity to shoot a pre-ceremony bridal shoot which turned out great indoors because of the morning rain. We encountered many pleasant experiences throughout the day and Jay and Terenaâ€™s celebration has certainly become a highlight of the season. Heading out to Torontoâ€™s Centre Island for a shoot with Heather and Darren (a.k.a. HeeHee and Dash), we confirmed the clichÃ© to be true: Time flies when youâ€™re having fun! With the intent of spending only a couple of hours breaking the ice and getting a few great shots; we finally called it day after shooting for over 5 hours and exploring the islandâ€™s wondrous scenes. How can you possibly stop short with all the amazing greenery, the beach and Torontoâ€™s stunning skyline. In compliment to the location â€“ here is a couple that oozes with passion! We meet a lot of couples throughout our bookings and event coverage; but Heather and Darren definitely have chemistry worth noting! Hope the vid displays the enjoyment we experienced shooting and editing this one together! 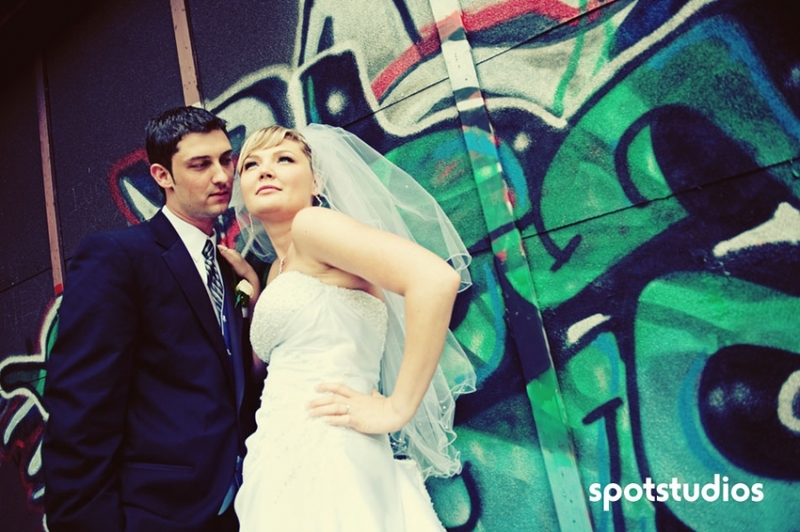 Heather+Dash from spotstudios on Vimeo. Giap (Zap) and Winnieâ€™s celebration proved to be a wondrous experience as it was our First Traditional Vietnamese Wedding! We had to keep cleaning the humidity off the lenses at the Allen Gardens, Toronto – but the backgrounds and colours were well worth the sweat. We were also blessed with the weather holding out – so we explored the grounds of University of Toronto and ended up with some spectacular shots! We had an amazing time covering this wedding and were very happy to be part of this amazing coupleâ€™s day. Giap and Winnie’s reception sure wasn’t short of any GLAM! Held at the Le Jardin Banquet Hall in Vaughan; It was a night filled with amazing dÃ©cor, beautiful arrangements, entertaining performances and spectacular ambiance. We had a great time capturing this ‘chemistry filled’ couple that truly shined through our lenses. We walked around Humber Bay park – which is now a local spot to our new studio space – not only getting to know Mike and Carmela a little better, but the shoot exposed us to our new neighbourhood as we checked out potential photo locations. We found some great textures and backgrounds, but also found some deterrents…. like in the tall grass – where Carmela ended up with Poison Ivy on her legs – But in the name of getting the perfect shot, it was all worth it!?!?!?!?! A huge thanks goes out to the both of them for being such amazing sports and for allowing us to capture their sparkle in our own backyard!